BOURNEMOUTH, England (AP) — Mamadou Sakho elbowed Jefferson Lerma in the face and conceded the penalty which Bournemouth converted to beat Crystal Palace 2-1 in the English Premier League on Monday. Substitute Junior Stanislas hit the winner in the 87th minute for Bournemouth to climb from ninth to seventh in the standings. Bournemouth went ahead early when David Brooks curled in a pass from Callum Wilson for his first goal for the team. 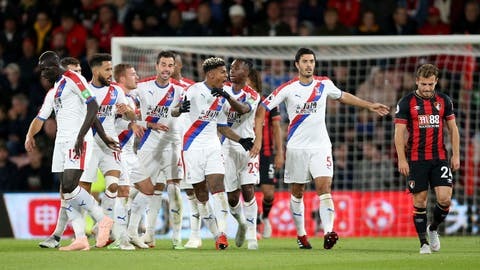 Patrick van Aanholt leveled for Palace 10 minutes into the second half from an offside position, cutting in from the left side and firing a right-foot shot into the roof of the net. Stanislas had been on the field only three minutes when he was picked to kick the penalty. He’s yet to start a Premier League match after six months out with a knee injury.